The impact of objects falling onto a surface produces pressure, which spreads outwardly as waves, whether a car randomly falls into a pit, or a diver falls with practiced precision onto and through the pool’s surface. You are invited to read or re-read the chapter Particles and Waving Fields. Compressing molecules makes them move faster. When molecules move faster, we call that heat. Compression produces heat. Heat causes the rarefaction of air, meaning the fast-moving molecules move away from each other. Why do they do this? As the molecules jiggle faster, they forfeit inside-space. As their radius shrinks their outside-space expands. We say the molecules are moving away from each other, but really it is the expansion of their outside space and the shrinking of their inside-space that makes it appear that way. 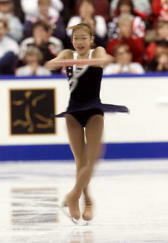 For example, the ice skater below spins faster as she Pulls her arms in, countering centrifugal force. Her effort reduces the radius of the planar circle within which she spins (A = ∏r²). This also reduces the surface area of the cylindrical column rising from the ice to the top of her head (A = 2∏rh). Reducing the surface area reduces drag/friction against air molecules. The straighter a diver enters the water, the less drag he has on the water. A clean dive has minimal splash-back. We call it rarefaction when the outside-space of air molecules expands, causing fewer molecules to occupy a given volume of air. When fewer molecules occupy the air, the pressure on them reduces. The pressure on a molecule comes from the Pushes of other molecules’ outside-spaces crowding in on it. Reduced pressure causes the molecules to relax and allow some outside-space to re-enter their inside-space, expanding their radius and slowing their movements. This reduction in molecular movement cools down the air. In cooler air the molecules appear to converge, but this is just because the molecules are larger, having more inside-space, and there is less outside-space between them. As molecules converge they feel more pressurized, so the process begins again. Compression and rarefaction alternate. Frequency, being the number of oscillations in a time frame, is higher in the compression phase of a longitudinal wave than in its rarefaction phase. The higher the frequency, the greater the compression. The greater the compression, the greater the kinetic energy. This is why blue light (higher frequency) ejects more electrons off a metal plate than red light (lower frequency). See photo-electric effect. A small amount of energy is lost as the rounds recur. The gradual depletion causes the wavelengths to grow longer and amplitudes to shrink over time. When the kinetic energy has been fully exhausted, there will be no amplitude left and the wavelength will have grown to infinity; in other words, it will be a flat line. Infinite rarefaction can be represented by a horizontal line. Infinite rarefaction means nothing ever happens. There is no gradient and no potential for anything to fall, move or change. Infinite compression, on the other hand, could be represented by a vertical line. Frequency per time relates to energy as distance per time relates to speed. At the speed of light, space contracts in the direction of motion (maximum compression). At the speed of light, no time passes; time dilates so that everything happens in one moment (maximum compression). When space contracts in the direction of motion, there is nowhere to go. Light cannot be going anywhere; it is not here nor there at some specified time, but everywhere at once. Light IS in this moment NOW wherever we look for it. Speed is the distance covered in a specified time. In either case, whether light goes nowhere, or whether it takes no time to get everywhere, it cannot have a speed. Perception requires time. Each moment has to be compared/contrasted with the one before it. The contrast is the gradient that Pulls the attention of the Observer, who then recalls what had happened that got His attention.